Berlin Experimental Educational Satellite, Technical University of Berlin. 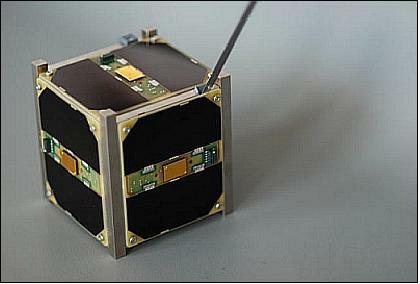 BEESAT (Berlin Experimental and Educational Satellite) is a picosatellite project at TU Berlin. The main objective is the in-Orbit-Verification of miniaturized reaction wheels. Up- and downlink with picosatellites of the BEESAT series is established by half-duplex GMSK modulated narrow-band radio at 435.950 MHz. The standard baudrate is 4800 bps but can be switched to 9800 bps for increased channel capacity at higher elevations. Each transmission at the higher baudrate is announced by a small 4800 bps header to allow for adaptive receiver re-configuration. The output power of the satellites is 27 dBm (0.5 W) using quarter-wave monopole antennas with toroidal radiation pattern. Deployed and active – CW beacon not active and telemetry only over Europe. With an edge length of just ten centimeters and a total mass of one kilogram BeeSAT contains three reaction wheels that were developed as part of the German Aerospace Center (DLR) funded project in collaboration with industry, other advanced modules that to be used for the first time in space. 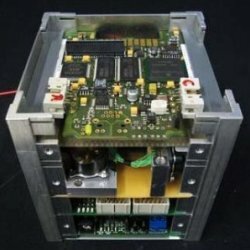 This includes a powerful and redundant on-board computer for Pico satellites. 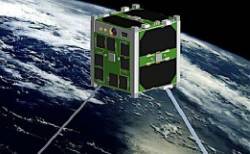 The software runs on a comprehensive flight by the Fraunhofer Institute for Computer Architecture and Software Technology (FIRST) provisioned operating system that is used successfully since 2001 in the DLR BIRD microsatellite and has been adapted for Pico satellite applications. The position control of the reaction wheels in addition BeeSAT uses a highly integrated system newly developed sun sensors, magnetic field sensors, solenoids, and sensors that measure the rotation rate. These components are controlled by an expensive position control software can also determine the web position onboard. Thus it is possible, regarding the communication to increase the autonomy of the satellites and ground stations to reduce operating expenses. Up- and downlink with Pico satellites of the BeeSAT series is established by half-duplex GMSK modulated narrow-band radio at 435.9500 MHz The standard baud rate is 4800 bps but can be switched to 9600 bps for increased channel capacity at higher elevations. Each transmission at the higher baud rate is announced by a small 4800 bps header to allow for adaptive receiver re-configuration. The output power of the satellites is 27 dBm (0.5 W) using quarter-wave monopole antennas with toroid radiation pattern. 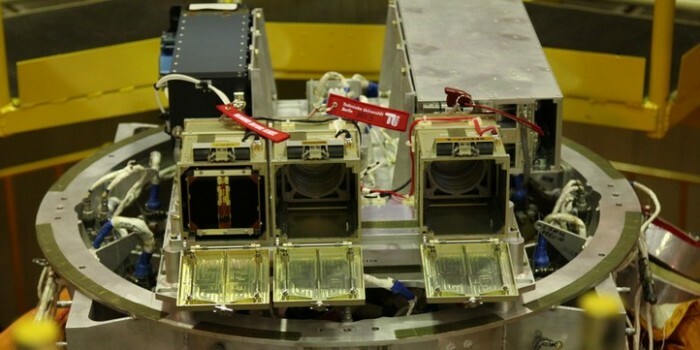 After the launch of Bion-M1 at April 19 at 10:00 UTC. We have to wait until Bion-M1 performs an orbital maneuver to reach a circular orbit at 575 km altitude only then the three CubeSats will separate, this will probably be after 32 Orbits (21/04/2013 at about 11:00 UTC). Unfortunately, so far we have no information about the exact date of separation. The sequence of separation with 16 second intervals is as follows: BeeSAT-3, SOMP, BeeSAT-2. Not heard. After the launch of Bion-M1 at April 19 at 10:00 UTC. We have to wait until Bion-M1 performs an orbital maneuver to reach a circular orbit at 575 km altitude only then the three CubeSats will separate, this will probably be after 32 Orbits (21/04/2013 at about 11:00 UTC). Unfortunately, so far we have no information about the exact date of separation. The sequence of separation with 16 second intervals is as follows: BeeSAT-3, SOMP, BeeSAT-2.